LA's Best Free Festival of the Year Is This Weekend. We've Got the Deets. 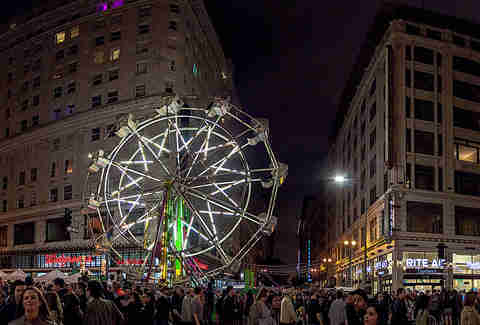 This Saturday, January 28, Night on Broadway -- LA's best festival you've probably never heard of -- returns to DTLA, shutting down a full mile of Broadway with tons of venues (from classic art deco theaters to restaurants to galleries) participating in a one-of-a-kind, melting-pot ode to the city. The best part? It's totally free. 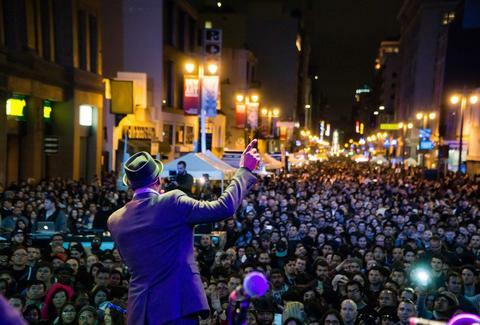 Funkmaster general/KCRW favorite Mayer Hawthorne is this year's headliner, but the main lineup's got a ton of great stuff, including Oingo Boingo Dance Party (featuring members of Danny Elfman's iconic LA band), East LA's Las Cafeteras, and beloved '80s tribute band The Spazmatics. 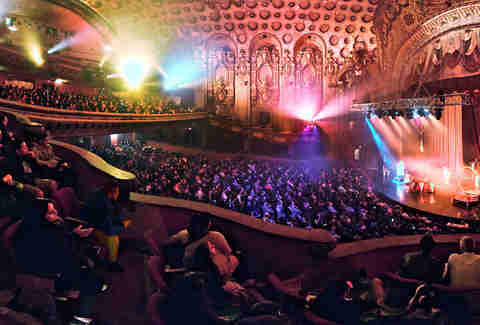 Many of the city's most beautiful theaters are open with focused programming during the event -- including The Los Angeles Theater, an S. Charles Lee-designed masterpiece that will be hosting immersive dance performances abetted with visual art from IAMSOUND. Elsewhere, the 104-year-old Globe will host sounds of the beloved '60s-and-'70s groove night Funky Sole, while the Palace Theater will have a revolving slew of comedians, The Million Dollar theater will host an event called "Recalling the Golden Age" with mariachi, swing, mambo, and pop musicians, the Ace has DubLab DJs blasting through a dance party all night, and the Orpheum will feature "The Art of the VJ" with speakers from LA's exciting visual arts scene. But even if they weren't hosting events, it'd be worth it to wander in and out of these former movie palaces, which represent a historic LA very rarely open -- and almost never free to to the public. 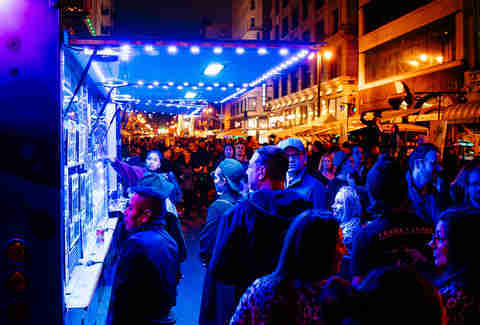 Angel City and PBR are hosting beer gardens, so you can get your drink on, and many of the city's best food trucks and loncheras will be peddling everything from carnitas to sushi. For the first time ever, there will be a dodgeball cage match -- which sounds like a mix between the two best days you ever had in middle school -- right on the street. But that's not all: There's also chessboxing (yes, it's a thing -- competitors compete in alternate rounds of both games, although this year they get to choose between boxing and jujitsu... seriously), as well as Lucha VaVOOM, the insane Mexican wrestling-meets-burlesque-meets-comedy show. The Boulet Brothers have curated what they're calling an "LGBT Stage Spectacular" with performances and DJs including Pogo Pope and Whitney Fierce. Tons of LA muralists, artists, and installationists are planning on displays -- including a 12-story harp installed from the ceiling to the street at 7th, and a street art challenge from the Mural Conservancy of Los Angeles. Some of the leaders in the VR field are bringing their toys to the street, with promises that participants can (virtually, obviously) scale Everest, ride rollercoasters, fall from skyscrapers, battle mech warriors, and... throw whiskey bottles. Yeah, that's a game. Even if, somehow, none of this appeals to you, the idea of walking the streets of DTLA unhindered by cars, navigating in and out of staples like Grand Central Market as well as Downtown's new art galleries, restaurants, and stores (with discounts at many of them, ranging from 20% off fashion-y stuff at BNKR to priced-down bikes at DTLA bikes) while participating in a massive civic celebration should make you very excited that this is the city you live in. And if it doesn't... well, you may want to get checked out. That's not even everything. Here's a video preview of this year's party. Thrillist LA editor Jeff Miller's great-grandfather was S. Charles Lee, so damn straight he gets a namecheck. Come to the afterparty from Night on Broadway at Casey's with his band Black Crystal Wolf Kids, or just follow him on Instagram.